It should come as no surprise that recent research from Aite Group found that more banks are partnering with fintech companies to manage their lockbox processing needs, which helps banks stay competitive by expanding their geographic coverage while avoiding high-price investments to develop solutions internally. CheckAlt helps banks stay competitive with its cost-effective, private-label lockbox solutions, Remit and RemitStation. CheckAlt's nationwide network is made up of 14 strategically placed processing sites in major metropolitan areas and is structured as a hub-and-spoke model, which allows us to quickly set up and launch new processing sites anywhere in the U.S.
More than half of all wholesale, retail, and wholetail lockbox banks in the U.S. are at least partially outsourcing their lockbox processing, according to Aite Group, and those numbers are growing. Many are considering fully outsourcing their lockbox services, while others are looking for a flexible option to help expand their footprint. CheckAlt offers all three options to address banks’ evolving needs. CheckAlt can easily manage volumes of retail billers’ standardized coupons and payments alongside the often-oversized remittance that wholesale billers produce. We scan and process 100 percent of a bank’s client receivables in a cost-effective, expeditious manner for wholesale, retail, and wholetail billers. By fully leveraging all of CheckAlt’s resources—from processing facilities to personnel, hardware, and software—banks can reduce operational overhead and convert their lockbox processing into a profit center. 1. CheckAlt can take over opening, batching, and scanning mail at existing processing sites for banks, and then send the raw payment data to a bank’s own lockbox software. 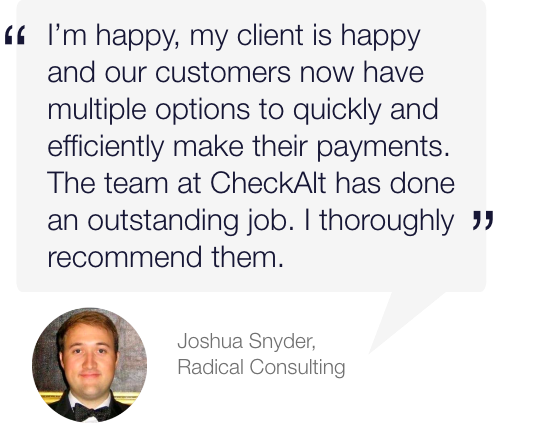 Banks get the benefit of the cost savings associated with employees, scanners, and site overhead, as well as CheckAlt’s expertise in front-end operations. Some banks have already built their own processing sites but are reaching capacity due to business growth. They need a jump start to get into a new market, and don’t have the resources to secure a location, hire and train staff, and purchase processing equipment to get an efficient, cost-effective lockbox processing center up-and-running quickly. To expand their geographical coverage, CheckAlt can integrate any of the processing sites in our network with a bank’s existing back-office system. The bank maintains its own internal software and sites, supplementing with CheckAlt’s streamlined operations that keep days sales outstanding (DSO) to under two days. CheckAlt works collaboratively with banks to design their ideal solution, reviews their client challenges and internal lockbox needs, and then develops a strategy for efficient implementation. Our lockbox processing solutions reduce payment float time, lower operating costs, create a new profit center for banks, and facilitate the transition away from paper payments and toward electronic. Contact us for a demo and learn how your bank can benefit from CheckAlt’s lockbox processing.